We all know that sleep is very important. Especially as parents, sleep becomes a most precious commodity and one that we don't always get as much of as we would like. But a new study is suggesting that sleep for toddlers is actually much more important than we realize. A new study in Academic Pediatrics examined the link between behavior and sleep in children, and found that poor sleep early in life may actually be linked to problems with behavior later in life. Specifically, the study looked at the associations between insufficient sleep and neurobehavioral functioning, as seen through the reports of mothers and teachers. Between six months and two years old: At this age, which combines both babies and toddlers, getting less than 11 to 12 hours of sleep per day per day was considered "insufficient" sleep. At this age, children need more than 12 hours of sleep per day. Between 3 and 4 years old: Moving through the toddler stage and into the preschool stage, children who had less than 10 to 11 hours of sleep a day were defined as poor sleepers. Between 5 and 7 years old: Obviously, children at this age are beyond the toddler stage, but at the school ages, less than 9 hours of sleep met the parameters for poor sleep. 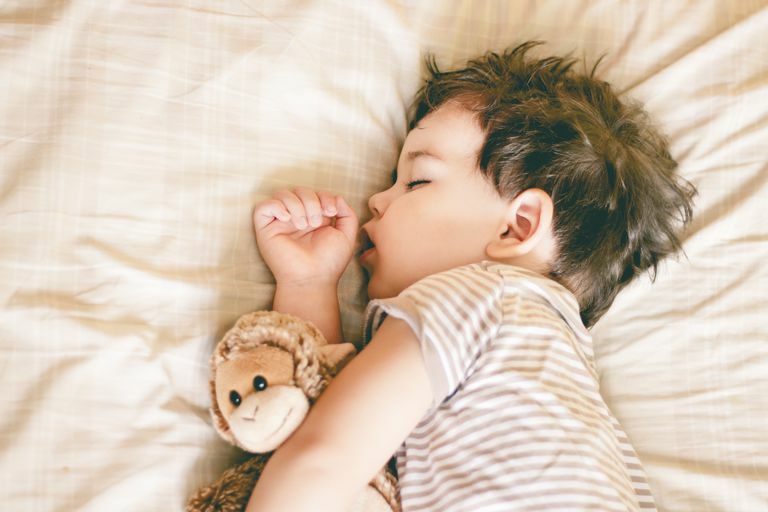 To assess the children, the researchers looked at executive function, overall behavior, and social-emotional functioning and studied how those outcomes related to the children's sleep habits. Unsurprisingly, the results of the study revealed that both teachers and mothers caring for their children reported that kids who were poor sleepers in the toddler years had more behavioral problems than those who slept longer. The ages of 3 and 4 seemed to be the most crucial, as those children had the worst scores. The hard part is that the toddler and preschool years can be the most challenging in a lot of ways, as children learn to communicate more and take on more independent roles. And if they aren't getting enough sleep, the behavior can get a lot worse. Infants with poor sleep habits had worse behavior scores when reported by teachers or caregivers, but not their mothers, which could have a lot of different reasons. Parents might have different standards, for example, or babies may sleep more at home than at daycare, or environmental factors might come into play. But overall, the study concluded that "Insufficient sleep in the preschool and early school years is associated with poorer mother- and teacher-reported neurobehavioral processes in mid-childhood." So what does all of this mean? Basically, that sleep is super important for everyone, but especially toddlers. There may be a link to brain development during the toddler years that can affect their behavior that we aren't fully aware of yet. We know that sleep is "work" for toddlers, meaning that a lot of their growth and development actually happens during sleep, so it makes sense to ensure that toddlers get on a healthy sleep schedule. Eliminate screens at least one hour before bedtime. Screens excite the brain, so instead of helping to "wind down" your toddler, they can backfire. Instead of using a tablet or TV, institute a bedtime book to help calm your toddler down. Be consistent. It can be so hard, but consistency is key. If you are training your toddler to sleep in his or her own bed, for example, it may take repeatedly returning your toddler back to bed before you succeed. Remember that sleep can happen in spurts. Toddlers need about 15 hours a day to stay healthy, but that doesn't mean sleeping 15 hours straight at night. Instead, that time can be broken up among naps. And every toddler is different, so pay attention to your own child's cues that he/she is overtired and adjust accordingly.